AGCI Workshop Aspen, CO 2009 Workshop Advanced Climate Modeling and Decision-Making Support of Climate Services AGCI Workshop: Learning from Regions: A Comparative Appraisal of Climate, Water, and Human Interactions in the Columbia and Colorado River Systems Aspen, CO 2003 Excerpted from the presentation “California Hydroclimate, CALFED and EWA"
"We have a host of questions and problems that confound the actions that you might take in ecosystem restoration..."
In this clip from the 2003 presentation “California Hydroclimate, CALFED and EWA,” USGS Project Director Larry Smith describes challenges facing watershed health in California. Examples he includes are: the presence of mercury and increased sediment loads from mining, loss of wetlands to urban development, loss of salmon habitat, the introduction of invasive species, use of pesticides, and accumulation of selenium. 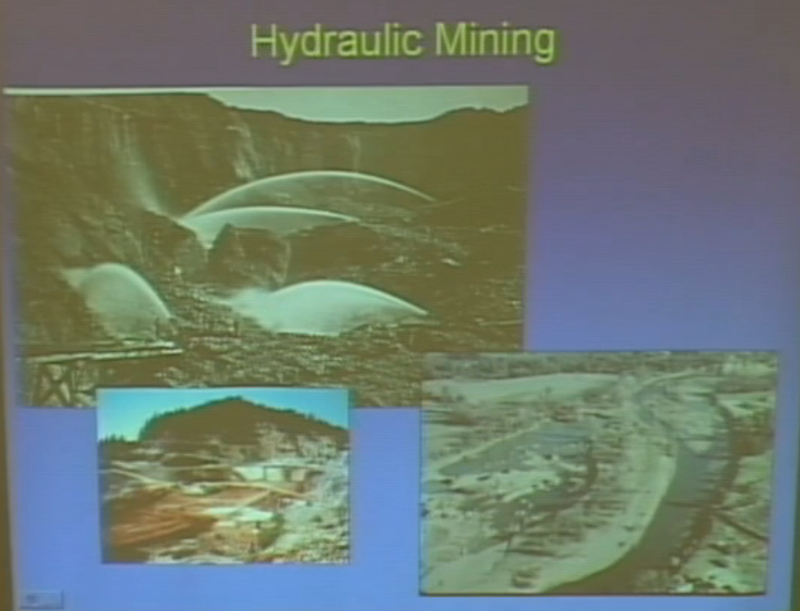 Individuals and organizations charged with water management, such as the US Geological Survey (where Mr. Smith was employed at the time of this clip), use multiple sources of information to assess the health of a watershed. They may make current observations, such as seeing erosion from a mine muddy water or taking measurements of the amount of selenium found in fish. They also use historic data to compare current and past fish populations or land use. Because the health of a watershed impact human health as well, water quality and availability tend to be well documented. As a result, scientists and public employees, like Mr. Smith, can compare the results of multiple research studies in order to make certain that their observations fit logically with current understanding of how their watershed functions. The presence and quality of water are essential to life, industry, agriculture, and ecosystem survival. Yet water availability and health can easily be altered. 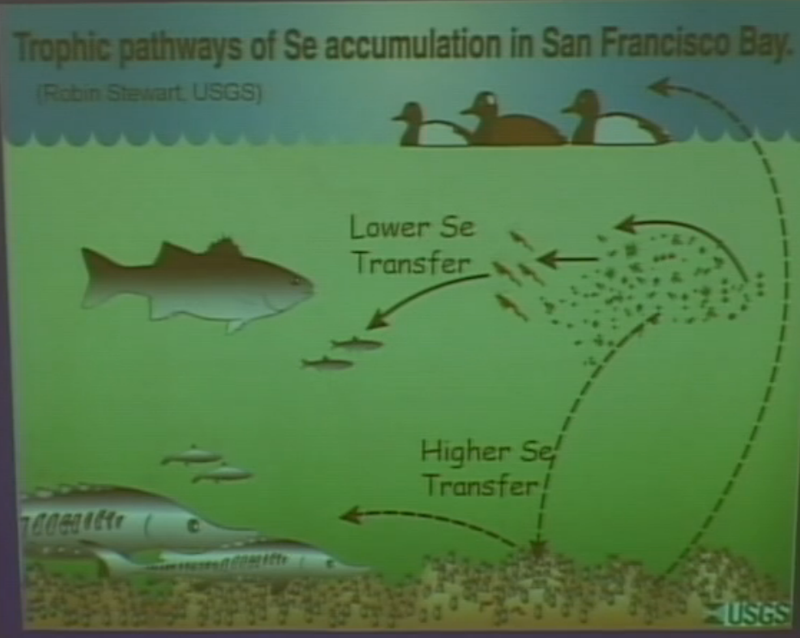 As Mr. Smith describes, human activities can lead to increased amounts of sediment, toxic metals, or even new species in a watershed. The introduction of any of these components can contribute to ecosystem changes, die-off of species formerly found in the watershed, and threats to human health. Projects directors such as Mr. Smith research these changes and offer the local government and the public information about how such threats can be mitigated. What are some types of human activities that have impacted California's water? Of the different impacts to California’s water supply listed by Larry Smith, which do you think are the most important and why? Many of the causes of watershed damage are a result of human activities that otherwise benefit society-for example, mining can bring economic benefits to a region and urban development creates places for a growing population to live. Pick one of the environmental threats Larry Smith describes. How do you think this threat could be diminished while still offering the societal benefit created by the cause of the threat? Take a look at the final slide shown by Larry Smith. How does a metal, like selenium, end up in a fish's (or your) body? Many places in the United States have water concerns similar to California's. 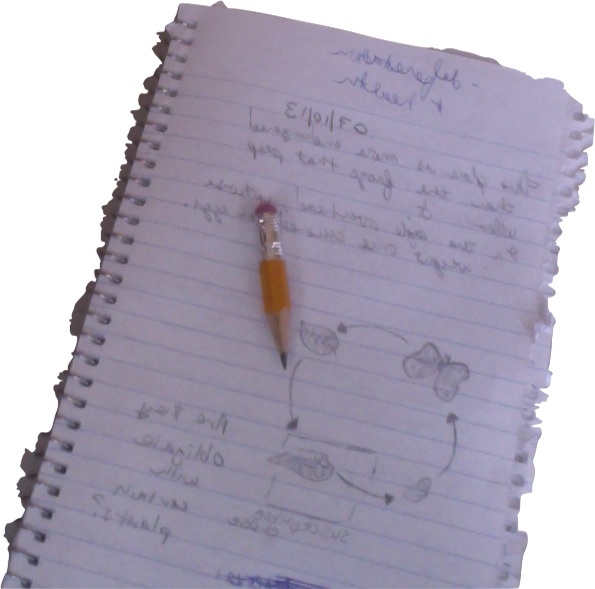 Use your science journal to research your own watershed. 1. Brainstorm: Close your eyes, and imagine your neighborhood and your city. Draw a map of the area where you live, including rivers, streams, and lakes. Then, draw in any human activities or recent natural events that might change the quality of your water, such as factories, farms, mining, mud slides, etc. 2. Use online maps, an atlas, or resources from your local library to look up where the rivers and streams are in your region. Alter your old map or draw a new one to include any bodies of water you may have missed before. 3. Use the Internet, such as Google Maps' satellite view, to draw in what surrounds your water bodies. Are there buildings, vegetation, or bare land? Alternately, you may look at a city-planning map or walk a section of the nearest river or stream. 4. Conduct an interview. Contact someone within your community who is involved with water health. You can try the public health department of your city, the local EPA, a local university, or the water sanitation district to find people whose careers focus on water quality. Ask the water expert you contact about local threats to the water quality and what is being done to address those threats. 5. Record what you learn during your interview in a two-column list. 6. Looking over your investigation so far, what do you think is the greatest threat to water health where you live? Does it most concern human health, ecosystem health, or wildlife health? 7. Make a plan. Now that you know more about your watershed, is there anything you think should be done to better protect its health? If so, write down your ideas for that improvement. If you have a concern that you think could and should be addressed soon, write a letter expressing your opinion, and send it to a local representative or water manager. Which of the following is NOT listed as a concern by Larry Smith?